The heat of the past few summers has been memorable, stifling. The stress of the heat always challenges us to find new ways to survive it. This season is no exception. In all of my 70+ years, two years ago was the first year I tried taking a shower and going to bed wet. It works! I stayed cool enough to relax and get to sleep. Here is an idea for the middle of the day when the shower idea would probably be useless. Fill a jar with slices of lemon or lime or both. As you layer the fruit, add sugar, the sugar of your choice. You may prefer honey or maple syrup. (Good for you.) No problem! Press on the fruit as you layer it to start the release of juices. Set a lid on the jar to keep bugs out. But, do not screw the lid on. You want some air to be able to escape from the jar. Keep the citrus-filled jar at room temperature. We kept it on the island where we usually fix our drinks. After a day or so begin pouring a little of the citrus syrup into a glass of soda water. You do not need much of the syrup to make a cooling, refreshing drink. After a few days the syrup will begin to ferment, adding another dimension of flavor and interest to your drink. As the syrup gets low in the jar, add more sugar and work it into the citrus slices. They still have plenty of flavor to release. We kept a jar going for three weeks before releasing it to the compost. 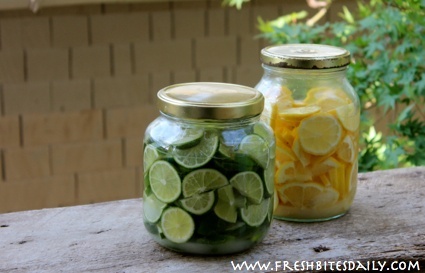 Preserved Lemons: 3 Methods To Preserve Your Lemons With Salt! ✅ Pickled orange and onion in a vinegar base, a great addition to salads! And you wondered what to do with all that orange peel … perfect gifts! 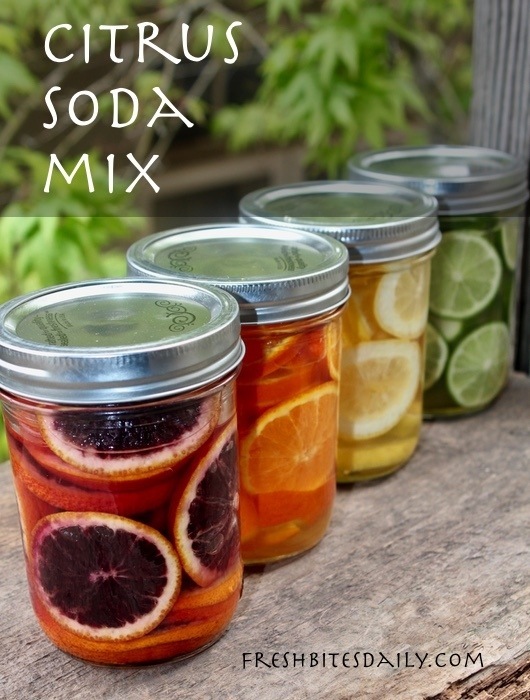 1 Comment on "A refreshing and simple citrus soda mix, ready for your seltzer"
Love this post!! I’m always looking for “the taste of summer-in winter” beverages!! 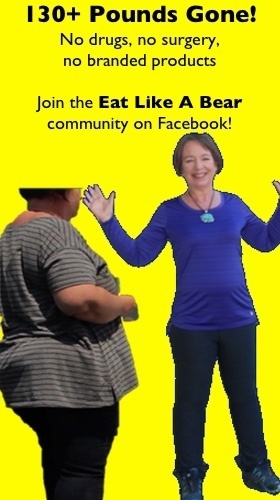 I am wondering if you could use stevia instead of the sugar/honey/maple syrup? Have you tried?